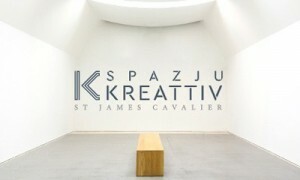 Spazju Kreattiv is at the centre of what we do, where one of our main priorities is to provide space for individuals to express themselves creatively and for the rest of us to get to know about their process – how it starts, evolves and possibly, how it ends. Wiki Loves Art 2019 in Malta is a programme of activities occurring between January and April 2019 centred around documenting art in Malta. Space A presents Art from the Fondazzjoni Kreattività Collection 2013-2018, comprised of a selection of works that have been collected from events held at St James Cavalier and from the Spazju Kreattiv programme between the years 2013 and 2018. Space C displays a number of works from the Fondazzjoni Kreattività collection by women artists whose works have been exhibited at St James Cavalier between 2000 and 2018. Space B hosts an exhibition of the recent activities by Wikimedia Community Malta. Four Art Additives events are occurring in this period that support the documentation and legacy of the works being displayed. These events are organised by Spazju Kreattiv in collaboration with Wikimedia Community Malta, the M3P Foundation, the Gabriel Caruana Foundation, and the US Embassy Valletta.